A Cooking Bookworm: Totally Random - BEST BUY gift card GIVEAWAY! 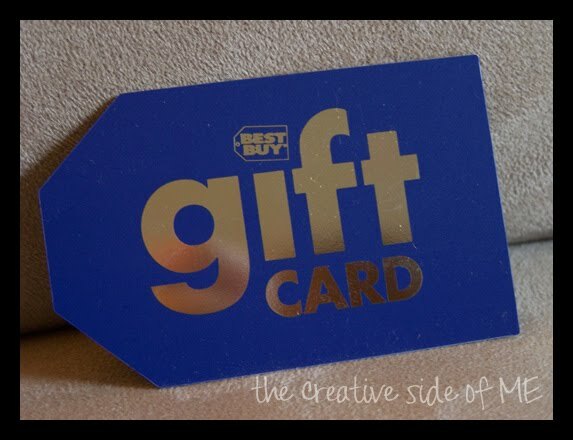 Totally Random - BEST BUY gift card GIVEAWAY! But, I received a $15 Best Buy gift card in the mail (long story), and I'd rather give it away than spend it! So, what are we waiting for?! Want to WIN IT? One winner will receive a $15 gift card to Best Buy. To enter, follow The Creative Side of Me via Google Friend Connect (widget in sidebar) or subscribe by email (must confirm subscription). Make sure you leave a comment saying you did so. All entries will be verified. Entries that do not fulfill guidelines will be deleted, so read carefully! Entries accepted until Friday, October 8, 11:59 PM (EST).Winner(s) will be chosen by random.org and winner(s) will be notified by email. Winner(s) must confirm prize email within 48 hours or another winner(s) will be chosen. I am now following you on Twitter, and tweeted about the giveaway. I am a blog follower already:) Please enter me. Thanks! My Favorite Things - AVON Foot Works - GIVEAWAY!